Basically, iam not interested in management kind of books and am hesitant to read this kind of book. But, i found this book very interesting with many real time examples and research study facts. 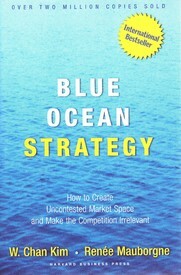 It is a must read for entrepreneurs who want to do something new in the business or implement new strategy. No wonder, it was the best management book in 2006. 1. What are the factors that industry takes for granted and can be eliminated? 2. What are the factors that can be reduced well below the industry's standard? 3. What are the factors that can be raised well above industry standards? 4. What are the factors that should be created that the industry has never offered. Practically, we can use this four actions framework to create a blue ocean in any industry. If we take 'redbus.com' as an example, they reduced the complexity of booking a bus ticket to anywhere in India by a simple and easy to use website. They eliminated the need of agents to book a bus in less time. They raised the standards of bus travel booking experience by providing a good search feature and displaying ratings of the bus by different parameters like punctuality, cleanliness, service and comfort. And finally, they created a new service to customers that never existed before in the industry. This book can be very useful for someone who wants to start a new business or make changes to the existing business. It is also helpful for management students to understand a new business strategy with different case studies mentioned in the book. What i liked in the book? It gives you a different perspective on industries and business strategies. Writing style is simple without complicated management jargon. Many real life examples are given throughout the book which are very interesting.